Tap into powerful Earth Ener-Chi when you walk our 7 Circuit Crystal Labyrinth or 5 circuit Dragon Spiral while intoning Fire Letters during one of our Transmissions sessions. These labyrinths were constructed on power spots that were located by using Dowsing rods to identify powerful ley lines or energy streams. Leylines are currents of positive and negative energy that flows in a grid pattern around the planet . Any structure or being that this energy passes through will be affected such as humans, animals, plants underground streams and minerals. If we stand in one of these areas of high energy, we will be affected both physically and psychically. All Ley Lines meet at intersecting points, forming a matrix or grid across the body of the planet. These grid points, are the strongest “power spots” on Earth. The Ancients were aware of this and so constructed Pyramids, Temples, Standing Stones, Stone Circles to align this energy with the Stars and Inner Earth. This alignment created dimensional gateways for beings to travel from other worlds. Mapping the energy lines of our property made it possible to know where to go to access a burst of power. We found that sitting on or within these areas was a great aid to meditation or contacting with Christ Consciousness or the Divine Feminine. The radiating energy current amplifies a person's ability to make contact with other dimensions. 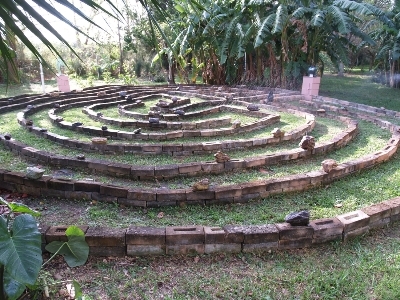 The labyrinths are enhanced by a variety of crystals and gemstones that are located on the walking paths. The Divine names of God, Angels, Ascended masters written in Fire Letters line the pathways. Here you feel the energy of the crystals. Natural crystals and gemstones have been used throughout history for their healing properties. Warriors used crystals and gemstones on their armor. Healers made elixirs from natural crystals and gemstones. The same energy is found in Tai Chi, Chi Gong, Shamans, Native American Ceremonies, Churches, and Prayers. This unseen energy forms a halo around all matter, forms the matrix of all cells and tissues. This energy heals by tapping into the crystalline grid of the earth. A huge Cypress Tree has been incorporated into the Labyrinth design that is energically linked into the El Tulle Tree in Mexico. The Tulle Tree, or El Árbol del Tule, is a Montezuma cypress tree on the grounds of a church in Santa María del Tule in the Mexican state of Oaxaca. It measures more than 119 feet around but is only 116 feet high. It's believed that the tree is about 2000 years old. Local legend holds that the Tree was planted 1,400 years ago by a Aztec priest connected to Atlantis and underneath the Tree is buried the heart of the Ancient God Feathered Serpent. In 1987, the heart awakened and the Tree now radiates Cosmic Christ Consciousness vibrations out through its astral leaves and sends it around the planet. Our Cypress Tree Guardian is an active communication channel forenrgy that is vibrating from the El Tulle Tree .